Aortic stenosis is characterized by impaired myocardial perfusion reserve due to coronary microvascular dysfunction. T1 mapping is sensitive to myocardial water content of both intra- and extracellular in origin, but the effect of intravascular compartment changes on T1 has never been assessed previously. We aimed to assess the effect of adenosine-induced vasodilatation on native (pre-contrast) T1 values in patients with severe aortic stenosis (AS) before and after aortic valve replacement (AVR). 42 subjects (26 patients with severe AS without obstructive coronary artery disease and 16 controls) underwent cardiovascular magnetic resonance at 3T for native T1-mapping (ShMOLLI), first-pass perfusion (myocardial perfusion reserve index-MPRI) at rest and during adenosine stress, and late gadolinium enhancement (LGE). AS patients had increased resting myocardial T1 (1196±47ms vs. 1168±27ms, p=0.037), reduced MPRI (0.92±0.31 vs. 1.74±0.32, p<0.001), and increased left ventricular mass index (LVMI) and LGE volume compared to controls (Table 1). T1 values had positive correlation with LVMI, LGE volume but an inverse correlation with aortic valve area and MPRI. During adenosine stress, the maximal T1 in AS was similar to controls (1240±51ms vs. 1238±54ms, p=0.88), possibly reflecting a similar level of maximal coronary vasodilatation in both groups (Figure 1). Interestingly, the T1 response to stress was blunted in AS (ΔT1 3.7±2.7% vs. 6.0±4.2% in controls, p=0.013). 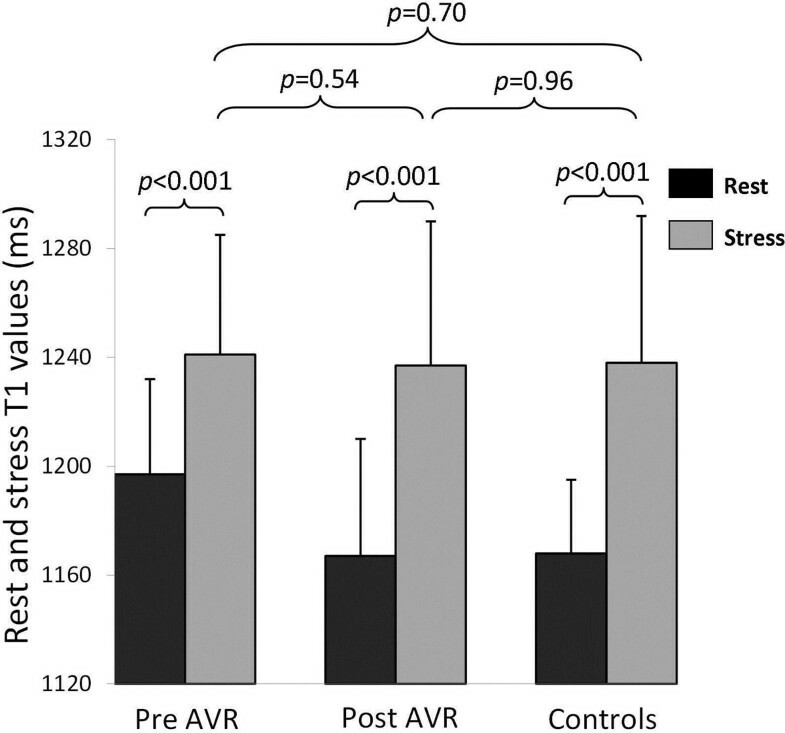 Seven months after AVR (n=16) myocardial T1 and response to adenosine stress recovered towards normal. Values are mean ± SD or percentages. CMR indicates cardiovascular magnetic resonance; LGE, late gadolinium enhancement; LV, left ventricular. Rest and adenosine stress T1 values. Our findings suggest that intravascular compartment is a significant contributor to myocardial T1 relaxation time. Vasodilator stress T1 mapping may be a potential technique to assess coronary reserve without the need for contrast administration. Performing T1 mapping soon after vasodilator stress may affect ECV measurements given that hyperemia alone substantially alters T1 values.